← Lenka live in Singapore 2015 – Welcome to Lenkaland! 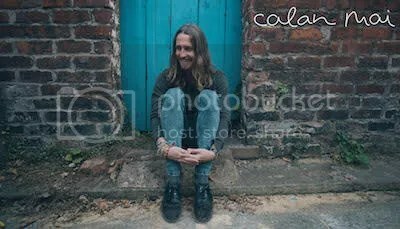 Australian singer-songwriter,Calan Mai aka Jordan Lawrence has unveiled a new single Mountain Mountain which was recorded over three months at his home in Manchester, UK. Jordan followed the footsteps of fellow Canvas Sounds signees, FAIRCHILD and Lyon Apprentice whom moved from Gold Coast, Australia to Manchester to concentrate on music back in February. Mountain Mountain is a lush new folk-tronic ballad. Jordan wrote the song two years ago and shared that the meaning of the song changed after moving to another country. “Mountain Mountain was meant to be about the inevitable change caused by that sort of time and pressure – the fact that even rocks aren’t safe. It took moving to another country, losing all my money and being forced to accept my old life was over before I understood the heart of what I’d written,” explained Jourdan. He further shared that he wants to change the meaning of the song because he wants it to move along the same way life has changed for him ever since. Basically, this song explains that change is inevitable and perseverance is key in overcoming any obstacles faced. Meaningful lyrics accompanied by great voices equates to a awesome song! I’m sure you heard a female voice in the single. It is non other than our local talent, Linying. Linying has performed with the boys from Lyon Apprentice when the boys were in Singapore! Listening to the single reminds me of Lyon Apprentice maybe because this single is produced by Adam Lyons from Fairchild and Lyon Apprentice. This single is a follow up to his debut EP, Days on the Rock Face, which was released back in July. It has been getting encouraging reponses from BBC Introducing, 6 Music, Triple J and reached #10 on the KKBB singles charts in the US. It is no wonder this debut EP is a success. You have got to listen to it. Listening to him reminds me of Jason Mraz. Right? Check out Submarine from the EP! Can we have him in Singapore for Music Matters Live 2016? If you would like to be updated on Calan Mai’s activities, follow him on Twitter and like his Facebook Page!